The ancient wonders of the world list is always being updated as new modern marvels rival ancient architecture. New steel bridges and skyscrapers reaching amazing heights are quite an accomplishment. Yet, I still believe that the ancient structures that were included in the original world wonder’s list still deserve a spot there. Dating to the 2nd Century, the Pyramid of Giza (also known as the Pyramid of Khufu and Pyramid of Cheops) is the only original Wonder of the World still left standing. "Callimachus of Cyrene (305BC-240BC), Chief Librarian of the Alexandria Museum, wrote "A Collection of Wonders around the World." According to the original list, the Pyramid of Giza was one of the first added to the list. The pyramid is located in the city of Giza and is today a part of the greater Cairo area of Egypt. Newgrange is over 5,000 years old and according to Carbon-14 dates, it is more than 500 years older than the Great Pyramid of Giza in Egypt, and predates Stonehenge trilithons by about 1,000 years. The Great Wall was initially built in sections for protection against different states. The sections were then fused in 221-206 BC during the Qin dynasty. The wall served its purpose well up until the time when the dynasty was weak from within the walls. Both the Mongols and Manchurians were able to invade due to the weakness and poverty of the people, not the wall itself. It wasn't until 1368-1644 that the wall started to appear as it looks today. Mount Everest is located at the snowy peak of the Himalayas in Nepal, which stands on the border of Tibet. Mount Everest is the highest mountain in the world reaching heights of 29,028 ft. The atmospheric pressure at the top of Everest is about a third of sea level pressure, implicating that there is about a third as much oxygen available to breathe as at sea level. Individuals that have reached the top have often said this was the closest to God they would ever be. The Colosseum is the most famous monument in Ancient Rome. The original name was the Flavian Amphitheatre. Construction of the site was originally started between 70-76 AD and was completed in 80 AD. Its name was derived from a huge statue depicting Nero, essentially a colossus of him. The first celebration of the opening consisted of 100 days worth of games including 50,000 spectators that crammed into the structure. Founded in the 6th Century BC by the kings of the First Persian Empire, Persepolis is located 60 km northeast of Shiraz in Iran. The site was built to serve as a ceremonial and spiritual capital of the Persian Empire. The two staircases connect to a Gate of All Nations carved with various symbols from Armenians, Egyptians, Medians, and many others. Persepolis continued to flourish until 330 BC when Alexander the Great was said to set it on fire. The city of Persepolis was declared a World Heritage Site by the UNESCO in 1979. Borobudur Temple is located at the Borobudur District, South of Magelang, and Central Java. Based on the inscription dating back to 842 AD, Casparis suggested that Borobudur was at one time a place for spiritual worship. The closed structure of the temple describes of a certain type of closed off world. It is said that this lake is 25 million years old-the oldest lake on the planet. It is also the deepest lake, holding more water than all of North America's Great Lakes combined. Its marine life is composed of more than 1,500 animal species and 1,000 plant species. Baikal is not like any other lake on the planet in that it has oxygen- rich water that circulates from the surface to the deepest parts, implying geothermal vents. To help the effort, UNESCO has recommended that the lake and its watershed be designated a World Heritage Site. Palau's coral reefs began to grow millions of years ago when coral polyps colonized submerged volcanic mountains. There is said to be over 700 assorted species of corals and 1500 classes of fish making it the most diverse reef on the planet. 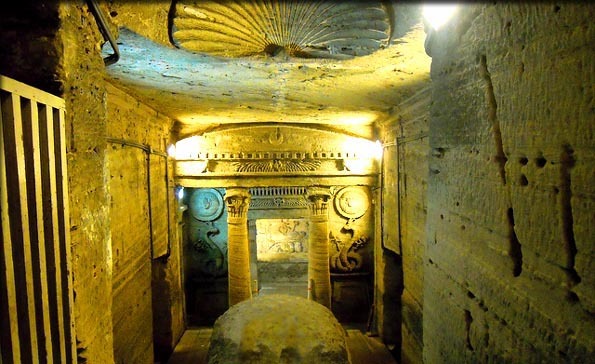 The Catacombs of Kom el Shoqafa, dating back to the 1st century AD, are located in one of my favorite cities on earth Alexandria, Egypt. It was a meeting place for people with common goals and tradition rather than war and destruction. Due to earthquakes and construction, the catacombs had been destroyed or obstructed. It wasn't until 1900 that by accident, a donkey fell through a hole in the ground and into the very heart of the structure. The Grand Canyon of the Colorado River is the largest gorge in the world-a 290-mile-long gash across the face of the Colorado Plateau in northern Arizona. Several distinct layers of sandstone, limestone, and shale speak of the advance and retreat of ancient seas, the building up and wearing down of mountains, the tortuous of rivers over 600 million years. It's been a revered spiritual site for Native Indians and a subject of mass speculation due to the age of the great structure. Machu Picchu was built around the year 1460, but deserted as an official site of the Inca Empire. Machu Picchu is a Pre-Colombian Inca civilization located 2,400 meters above sea level and it's situated on a mountain crest above the Urubamba Valley in Peru. It's often referred to as "The Lost City of the Incas" and is one of the most recognizable symbols of the Inca Empire. The Temple of Inscriptions is located at the eastern edge of the Rio Usumacinta Basin in the foothills of the Sierra Oriental de Chiapas at an elevation of slightly less that 3000 m. Even though the earliest occupation of the site dates to about 100 BC, it only became a population around 600 AD and all construction at the site had halted by about 800 AD. Petra was the capital city of Nabataeans and was dominated by a tribe of pre-Roman Arabs around the time of 6th Century BC. Despite several attempts to conquer their capital, the Nabataeans remained virtually self-regulating until the defeat of Antony and Cleopatra and the reunification of the Roman Empire by Octavian in 31 BC. In 106, the Romans finally captured Petra to mark the beginning of the decline of the city.